When I first received the book, The Homesteader’s Kitchen: Recipes from Farm to Table by Robin Burnside, I was immediately drawn to this cookbook because of its beautiful photography. My lovely girl (who is two) loved it as well, flipping through the pages constantly and telling me about the photographs (“butterfly”, “chicken”, “carrots” were among her favourites) – the photos were so beautiful that we kept returning to them time and again – in fact, she will still bring the cookbook to me to look at the pictures! 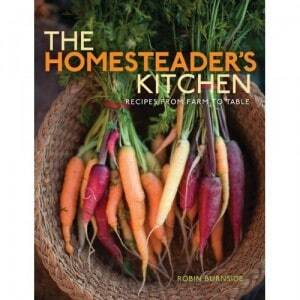 In addition to the beautiful photography, The Homesteader’s Kitchen is more than a typical cookbook. This cookbook has very organic sense to it, with a focus on natural foods and an encouraging nature to choose locally-grown and organic products. There are sections in the cookbook that address topics such as edible flowers and different elements that can be added to salads. I loved that there is a small section devoted to different types of coleslaw as well as vegetarian entrees and breads. There truly is something for every type of palate in this cookbook! I love this book and plan to use it more now that the summer is drawing to a close. I want to work putting together dishes to reflect local flavours and I think that The Homesteader’s Kitchen: Recipes from Farm to Table is just the cookbook I need to do so!